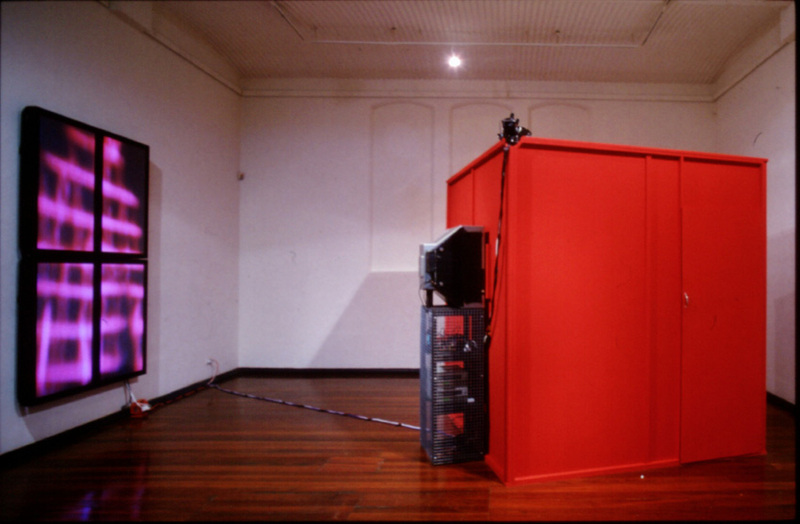 Geoffrey Drake-Brockman is a cybernetics artist specialising in large-scale public installations. His autonomous robotic and optical artworks interact with audiences to bring about dynamic human/machine performances based on mutual feedback. 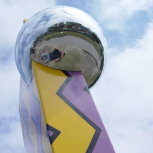 Geoffrey has exhibited in New York, London, Singapore, Aarhus, Perth, Sydney, Brisbane, Melbourne, and Canberra. He has shown work at The National Gallery of Australia, The Morris Museum, The Singapore Art Museum, and The Perth Institute of Contemporary Art. His public commissions include the eleven-metre-tall robotic sculpture Totem at the Perth Arena, the cosmic ray-activated automaton Readwrite at the NEXTDC Data Centre, and the interactive light sculpture Surface at the Perth Children's Hospital. "My background in Computer Science informs on ongoing project to create automata - interactive, self-determined, expressive machines - that test distinctions between person and artefact. 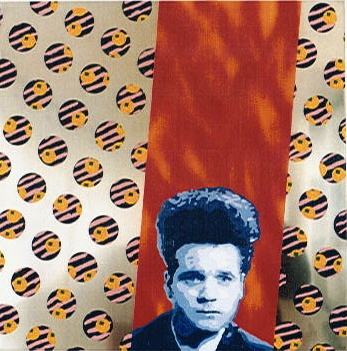 I seek to create works that are able to support unique, emergent, ongoing, dialogues between viewer and art object." "I am fascinated by robot mythologies - popular stories about 'made beings' such as Pinnochio, Coppelia, and Frankenstein. My work crystallises from these mythic possibilities to create technological agents that are behaviourally free, deeply connected, and that dwell here, among us." 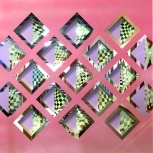 "In many of my works I include a reflective element - a mirror. This inclusion is deliberate, as I see every created being as a kind of mirror. The implication is that the relationship between creator and created is ultimately reciprocal. Via the precession of simulacra our creations reveal in us aspects of an 'inverse Pinocchio' – the real boy who wishes he was wooden." For more explanation see Geoffrey Drake-Brockman's TEDx Talk Created Beings or CNN's Great Big Story video Art of the Future in the right hand panel, or Geoffrey's paper: Created Beings: From Commonplace Motifs to Robot Myths and Simulacra presented at the Cyberworlds 2015 interdisciplinary conference on cybernetic realities. 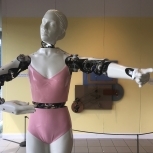 Coppelia One is an interactive humanoid robot that responds to audience movement by pirouetting and transitioning through the basic ballet positions of the arms. Coppelia One is the first doll from The Coppelia Project. This project ultimately aims to create a troupe of four robot ballerinas able to learn and perform ballet dance movements and interact with an audience. The Coppelia Project is inspired by the story about a clockwork girl from the ballet "Coppelia" by Delibes, based on an earlier work by Hoffmann. 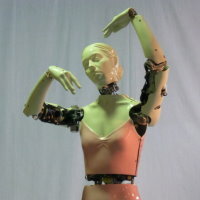 The robots' form is based on Jayne Smeulders of the West Australian Ballet. Coppelia One - has the additional name "Lilas Juliana Areias". Coppelia One was exhibited at Curious Characters exhibition of automata artworks at the Morris Museum, NJ, USA, curated by Michele Marinelli. 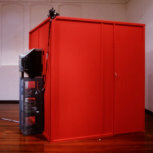 Six Devices : Popping Houses is an artwork that tells the story of its own composition, using six discrete “artistic devices”. The devices used are; volume, familiarity, reflection, colour, repetition, and interaction. 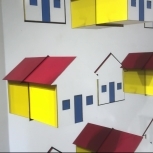 The final composition, with all six devices active, is an interactive kinetic tableau based on a childish house pictogram. SKY is an interactive installation that draws inspiration from the billowing white clouds and spans of sapphire-clear atmosphere that make up the Earth's sky. The work consists of 32 elements, set out in a 20m-wide grid. 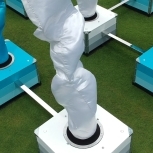 Each element has a air-jet that, when activated, inflates a 5m-tall vertical fabric plume which ascends and surges with pulsations of pressure and swirling motion. Half of the fabric plumes are sky-blue, and half are cloud-white. SKY has eight microwave sensors that detect passing pedestrians and a computer that composes choreographic responses to human movement. 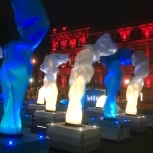 The activation of SKY was the opening event for the Perth Winter Arts Festival in 2017 and also for the Curiocity Brisbane festival in 2019. Parallax Dancer is an augmented reality installation that brings together a synthesis of traditional ballet; 3D animation; real-time control software; and machine vision. "Parallax” refers to the way that the appearance of objects differs as the angle of view changes. 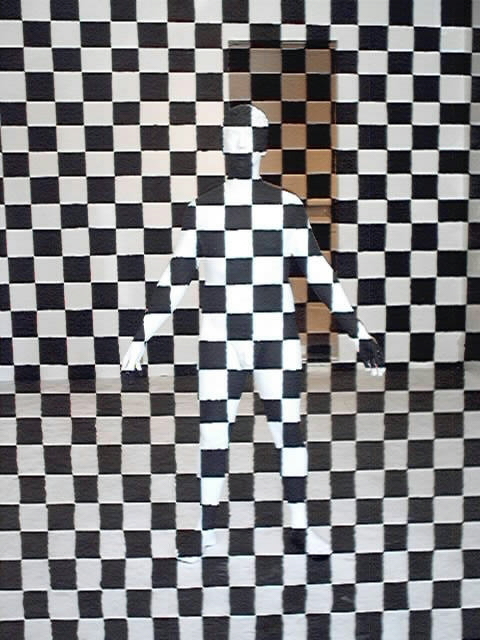 Using the parallax effect, it is possible to create an illusion of three-dimensionality, without relying on stereo vision. 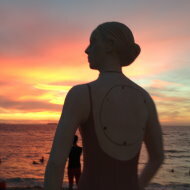 The work is based on a 3D laser scan of Jayne Smeulders of the West Australian Ballet. Scanning and 3D animation is by Phil Dench of headus. 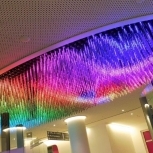 Surface is an installation of over 2,000 ceiling-mounted LED pixel tubes; it is some 10m by 5m in overall size. The work is an interactive light pond. When pedestrian movement is detected via one of four sensors a virtual stone is thrown into the light pond - causing ripples to travel out over the virtual water surface. Multiple ripples can disturb the surface - resulting in a complex interplay of interference patterns. 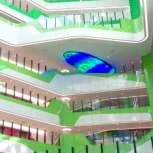 Surface is permanently installed in the central lobby of the Perth Children's Hospital. The Portal Series is a sequence of twelve geometric painted/reflective artworks, all 100 x 100 x 7 cm in size. 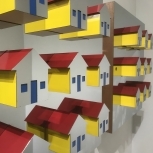 The works are wall-mounted and are 3D relief paintings - with negative interventions into the picture plane and references to trompe l'oeil and op art. The series consists of three different geometries: Circular, Square, and Triangular, each of these in turn having four variants. The variants differ systematically in their colour composition and the width of the reflective margin around the repeated geometric elements. .
Luminous is an interactive light sculpture in five parts, each of which consists of a 2m wide spherical form mounted on an 8m pole. The spherical structures are made from folded aluminium webs in a honeycomb arrangement that is evocative of traditional Chinese paper lanterns. At the core of each sphere is a set of 12 LED meteor tubes, which in turn contain a string of individually-addressable full-colour pixels. Motion detectors on each pole provide stimulus to a control program running on a microcontroller - which calculates colour-wave responses to human movement. “My reference was the movie Blade Runner and its futuristic Chinatown world, where overhead advertising blimps invite people to live off-world,... my overhead spheres are also invitations to come and live on different planets.” The work is illuminated nightly from 6pm and is permanently installed at Chinatown in Northbridge, Western Australia. Interlace is an interactive water sculpture using eight laminar flow fountains and four microwave motion detectors. The work responds to the presence of people with arcing overhead jets of illuminated water. When pedestrians walk under the jets they become “piggies” in an ongoing game of “piggy in the middle” played by the sculpture. 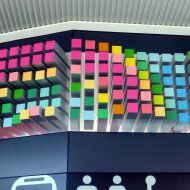 An embedded computer controls the operation of the laminar flow fountains - it has the aim of "weaving-in" its audience into an interlaced composition. 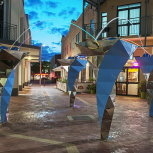 The work is permanently installed at Central Walk, Joondalup, Western Australia. Solar Jayne is a "spin-off" from The Coppelia Project. She is a life-size ballerina modelled after Jayne Smeulders of the West Australian Ballet. The body is made out of cast marble to withstand the elements and the mechanism draws power from the sun. Solar energy allows Jayne to pirouette, while she "spots" with her head. You need to press her buttons to make her go. If you press the "right" button she goes 'round and 'round, if you press the "wrong" button she just shakes her head. This work is based on the action of ripples from raindrops propagating across a still water surface. The work is a relief sculpture frieze that runs the full 40m width of the central concourse of Butler Train Station. 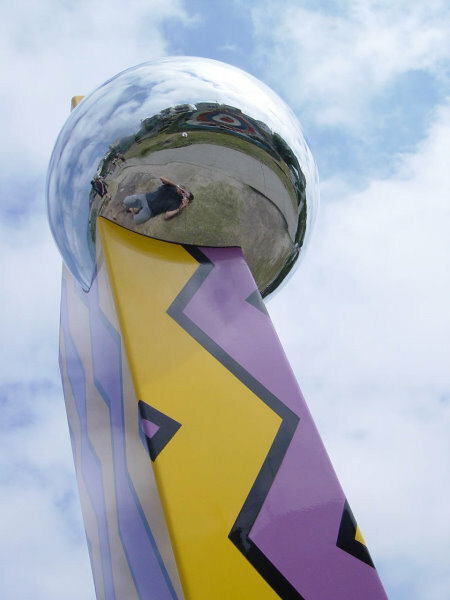 It is made up of a regular grid of some 1,200 anodised aluminium rods mounted on a reflective surface. 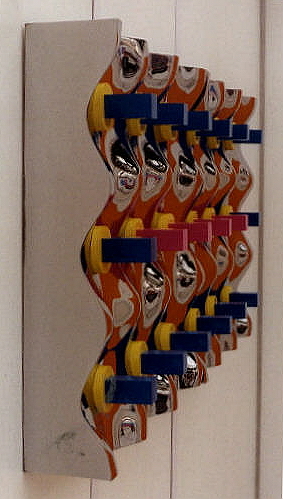 Each rod is topped with a brightly coloured square end-cap. The length of each rod and the colour of its cap are calculated according to a wave propagation and interference algorithm written for the project. Readwrite is located on the the NEXTDC Data Centre in Malaga, Western Australia. 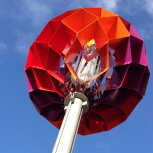 It is a robotic artwork 10m in length, with 24 pneumatically actuated rotating elements. Motion sequences on Readwrite are triggered by charged "Muon" particles. Muons are terrestrial Cosmic Rays generated in the upper atmosphere by interactions with high-energy particles which originate from distant supernovae and supermassive black holes in active galactic nuclei. 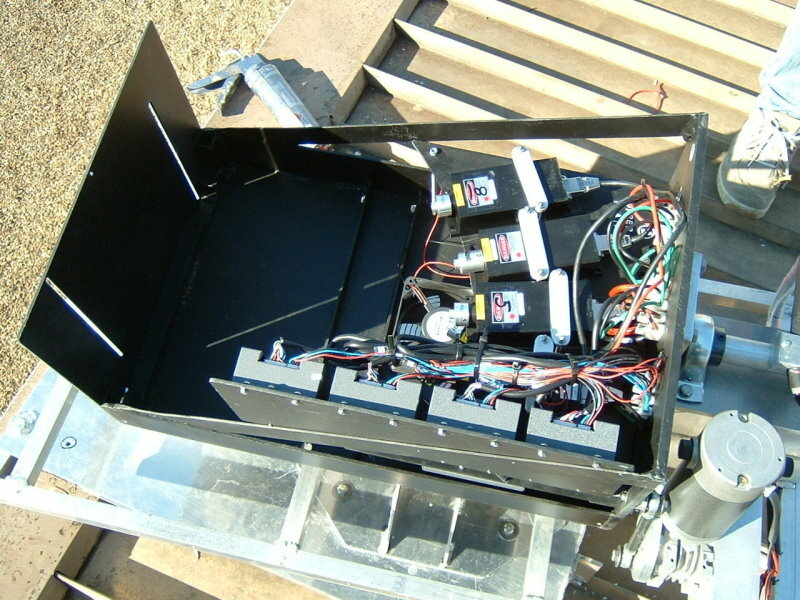 Readwrite has four Muon detectors - with one at each corner of the work. When a Cosmic Ray is detected, a wave motion sequence begins from that corner. The Coppelia Project involves the creation of a troupe of four robot ballerinas able to learn and perform ballet dance movements and interact with an audience. The Coppelia Project is inspired by the story about a clockwork girl from the ballet "Coppelia" by Delibes, based on an earlier work by Hoffmann. 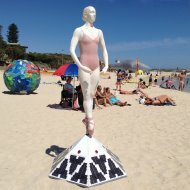 The robots' form is based on Jayne Smeulders of the West Australian Ballet. The first robot ballerina of The Coppelia Project; Coppelia One - has an additional name "Lilas Juliana Areias". Totem is an interactive spatial robot some 11m in height. 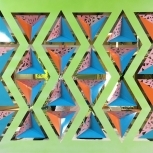 It has 108 reconfigurable petals and is able to react to pedestrian movement. Totem incorporates a laser projection artwork titled "Translight" that projects nightly onto the Eastern wall of the Perth Arena. 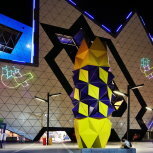 Totem / Translight is a permanent public art commission installed at the Perth Arena. 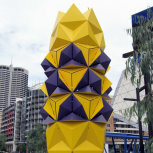 Totem has been nicknamed "The Pineapple" by the people of Perth. 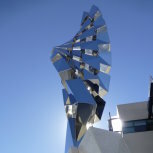 Spiral is a 9m tall ascending, twisting, form - with a complex faceted white granite base and an interlocking geometric superstructure of stainless steel prisms. 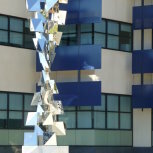 This work is a permanent public art commission and is installed at the Western Australian Police Headquarters in Northbridge, at the corner of Roe and Fitzgerald Streets. 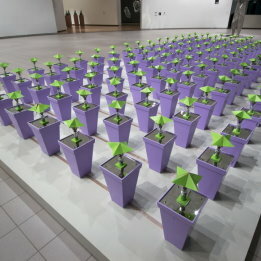 Floribots is an interactive installation consisting of 128 robot origami flowers with "hive mind” characteristics. It is capable of sensing audience movement and adapting its behaviour accordingly. Winner of the Peoples Choice Award, National Sculpture Prize 2005, Jury's "Best in Show" Award and People's Choice award at The Morris Museum 2018. 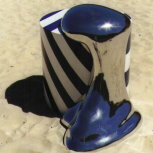 Also exhibited at Perth Institute of Contemporary Art 2007 and Singapore Art Museum 2010. "Floribots presents as a social organism, simulating behaviours that are those of both an individual and a colony. By way of some complex feedback cybernetics, a number of absorbing social realities arise in the interaction that an audience is able to experience with the work." - from catalogue essay by Dr Benjamin Joel. 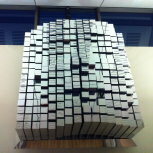 Headspace is a matrix of 256 motorised rods. Each rod is able to extrude some 40cm. 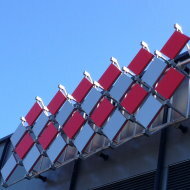 It is an interactive kinetic sculpture with four motion detectors able to detect human presence. 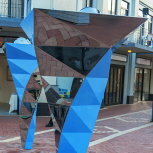 It is permanently installed at Christ Church Grammar School, in Perth, Western Australia. It was commissioned to commemorated the 100th year of the school. 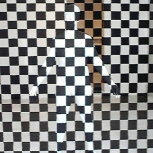 The system is loaded with 3D scan data based on the faces of over 700 schoolchildren, the rod matrix is able to assume these face-like forms as well as morph between them and perform geometric transitions. Counter was first installed near the entrance to the Perth Underground Train Station. Since then it has counted on the beach at Cottesloe, Western Australia, and at Aarhus, in Denmark. Counter is a solar-powered interactive installation that counts each pedestrian that walks though its archway. It is capable of counting up to one less than a billion, after which it will clock-over and go back to zero. The concept for Counter arises from the imperative to “be counted” or “make sure you count” that is part of liberal democratic cultural heritage. In addition, the work carries overtones of surveillance and scientific measurement. Clockwork Jayne is a life-sized ballerina figure mounted on a faceted mirror base. When its clockwork mechanism is wound up, the ballerina pivots slowly and a tune plays quietly until the spring winds down. The work draws on childhood memories of little clockwork music boxes, with ballerinas that popped up and rotated in front of a mirror when you open the lid. 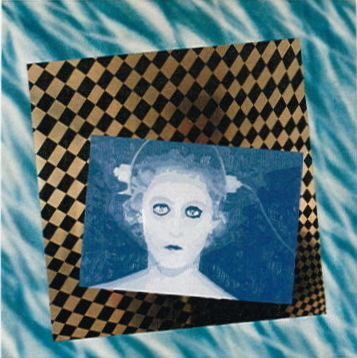 Clockwork Jayne was exhibited at the Holmes a'Court Gallery in Perth, Western Australia. Clockwork Jayne was produced with assistance from the West Australian Ballet and its principal dancer, Jayne Smeulders. 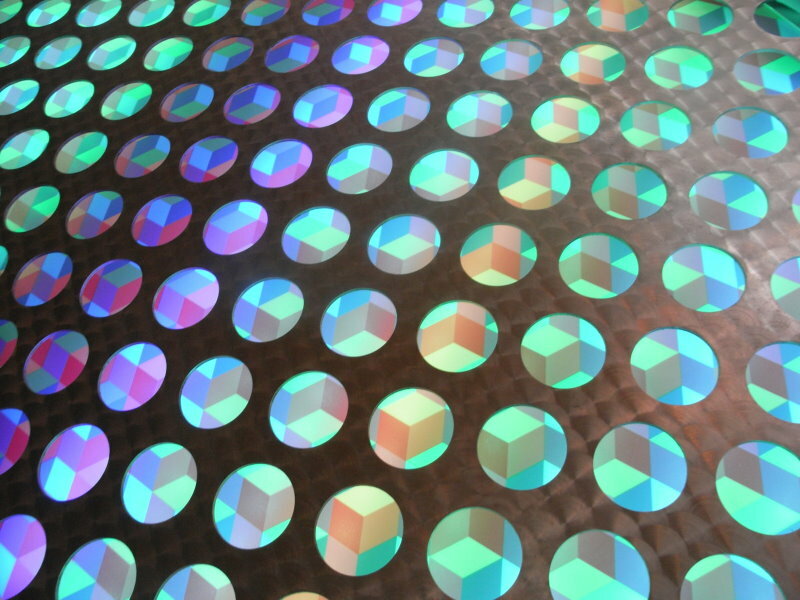 Optobot is an interactive optical wall panel incorporating four motion detectors and some 3,000 RGB LED lights mounted behind two perforated machine-turned stainless steel sheets. The LEDs shine light onto a printed, coloured, tessellated pattern to create colour changes by additive and subtractive mixing of colour. The system uses an embedded microcontroller to create multiple overlapping "waves in colourspace" that propagate across the work. Optobot is permanently installed at Automotive TAFE in Kwinana, Western Australia. Autobot is an interactive ceiling-mounted robotic artwork incorporating four motion detectors and 31 electric motors. The system uses an embedded microcontroller to create waves and transformations that propagate across the work then gradually diminish. 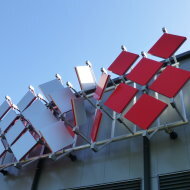 Autobot is permanently installed at Automotive TAFE in Kwinana, Western Australia. 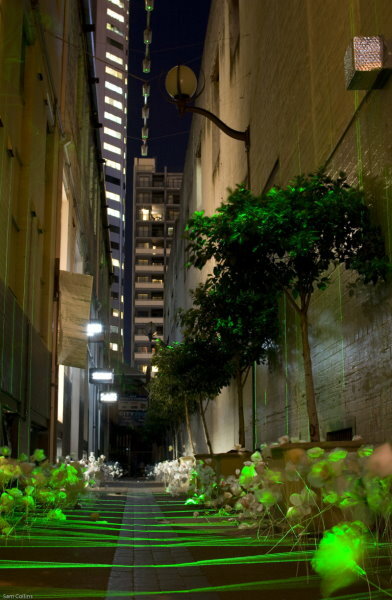 Optic Alley is an interactive laser installation consisting of sixteen pivoting green lasers mounted along a twelve metre stretch of narrow laneway. 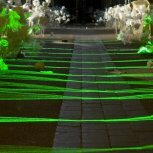 Optic Alley incorporates four motion detectors and a computer control system so that pedestrians approaching the installation trigger a cascading sequences of laser deflections to create waves that progress down the alleyway until they dissipate. 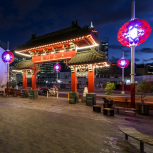 Optic Alley is the result of a Research and Development grant from the Perth Institute of Contemporary Art and Cultural Sponsorship from the City of Perth. Anemone is an interactive robotic sculpture. Anemone means "wind flower", but anemones are actually marine animals. 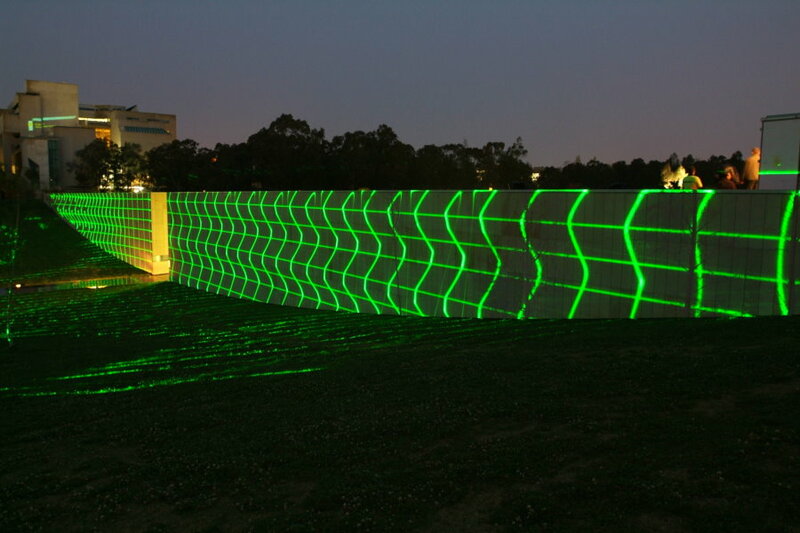 Transfiction uses a laser projection to redefine the surface of a built object - Commonwealth Place, in the Parliamentary Triangle, Canberra. The work explores fictional geometries, where the rules of solidity and linearity are temporarily suspended. 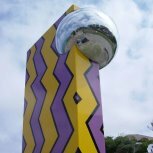 Located at the symbolic heart of our nation, this work was commissioned by the ACT Government as the entryway to 24:7 Public Art Programme of 2005. 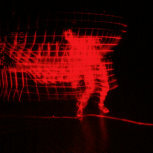 Essentialiser is an interactive appliance incorporating 60 small industrial red lasers, installed along three axial mounts. 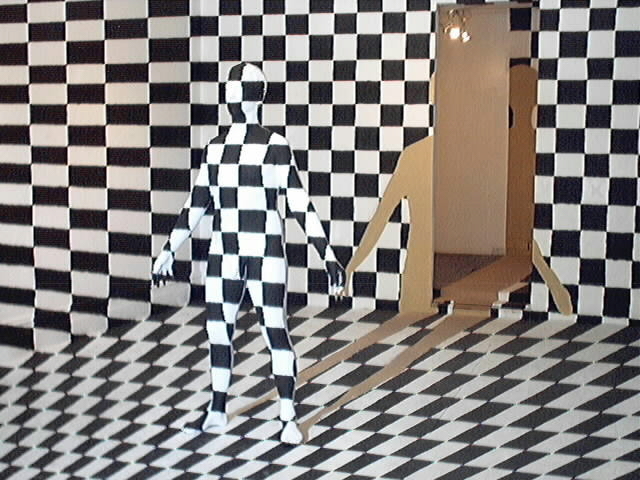 Audience members are able to pass through a door and enter the space where the 60 beams trace lines onto their bodies. 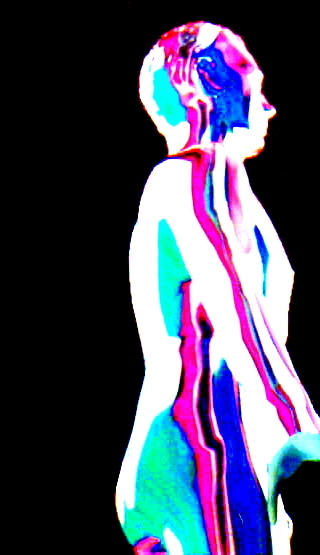 The projected lines are picked up via an infra-red video camera and displayed, on a feedback monitor inside Essentialiser, as well as on a large outside monitor, for the gallery audience to see. Collaboration with Richie Kuhaupt. 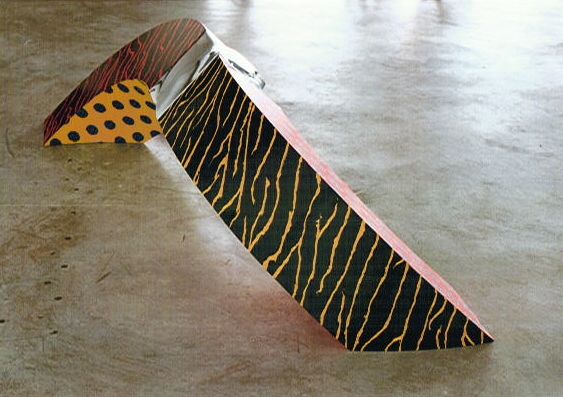 Exhibited at the Perth Institute of Contemporary Art and at Collaborative Concepts Gallery in Beacon, New York USA. Reviewed by Benjamin Genocchio, New York Times Arts Review, 28 Dec 2003. LaserWrap is a animated laser sculpture that illuminated the ACT Health Building for three hours each night. Twenty green lasers wrap the building in a gently undulating matrix of light cubes. 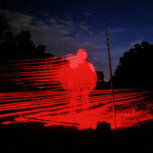 The artist's vision entailed embedding an existing built object into an active laser sculpture. They wanted to take the classic mathematical system of Cartesian 3-D co-ordinates - consisting of x,y, and z axes - and use it as a metaphor for a virtualising, postindustrial worldview. Collaboration with Richie Kuhaupt. 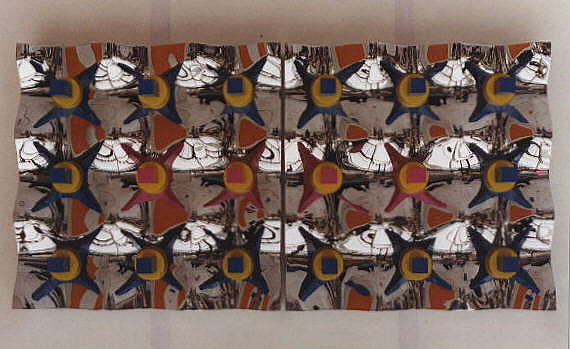 This work was an Exemplar, Year of the Built Environment, 2004. Essay by Bec Dean. Torso is a life-size human figure derived from a body cast of the artist. 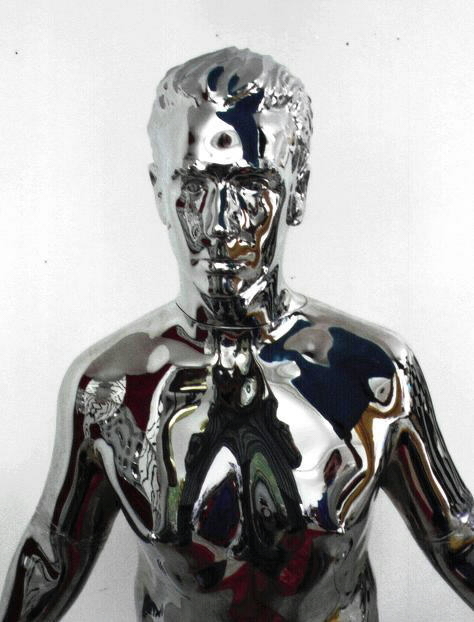 The outer parts of Torso are made from mirror-polished stainless steel, while the central section is made from a resin-bonded composite that consists of 75% powdered white marble. The central torso makes reference to archaeological remnants of heroic figures from Greek antiquity. The marble used as the material for this part of the work also plays to this classical reference. The outer parts of the figure are encased in "gloves" of reflective metal that evoke a hi-tech / sci-fi "chrome" signifier. Collaboration with Richie Kuhaupt. 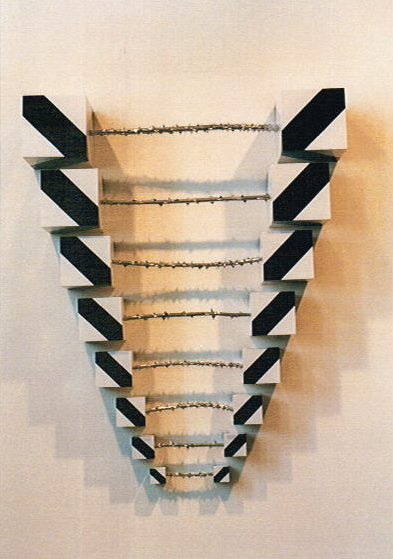 Finalist, Helen Lempriere Sculpture Prize. Neural Network consists of 18 nodes, regularly distributed over a mirror-reflective matrix-form. As the viewer changes orientation the nodes appear to intermittently make and break connections with adjacent nodes. Chrome surface produced by electrofoming over fibreglass. Winner, Princess Margaret Search for Genius Award. Bubblesort is a famous software sorting algorithm. This sculpture actualises the virtual bubblesort construct and credits it with agency and interactive potential. 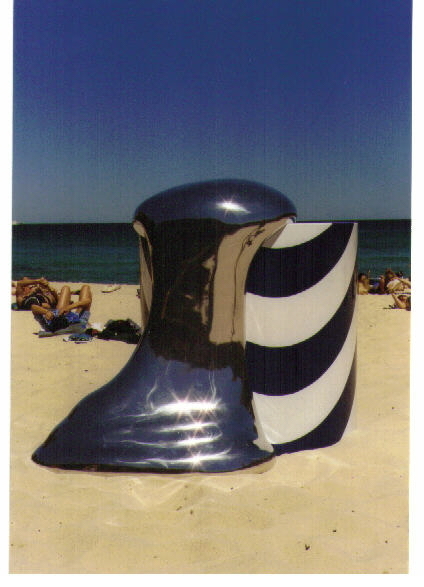 Exhibited Sculpture by the Sea, Bondi and Cottesloe. Pangenesis is a theory of inheritance where genetic information is derived from all parts of an organism. Pangenesis has been discredited in the organic context, but may be a viable schema for reproduction of virtual lifeforms. 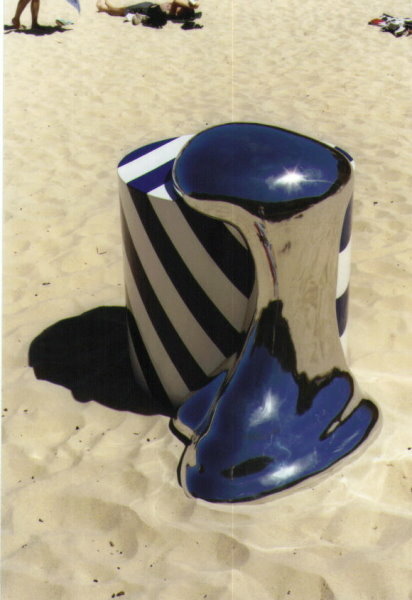 Acquired by the Sculpture by the Sea Collection. 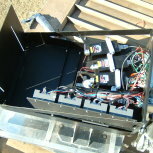 Jacobs Ladder is the ladder leading to heaven as seen by Jacob in his dream; alternatively, it is a device for generating a series of high voltage plasma arcs that ascend between twin diverging conductors before dissipating into the atmosphere. 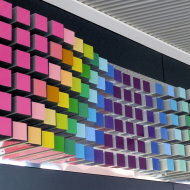 Exhibited at the Perth Institute of Contemporary Art. Lasercube is a programme exploring the application of planar beams of laser light to describe surfaces, objects and landscapes. The Lasercube technology involves 60 industrial lasers with hemicylindrical lenses. These are mounted on armatures arranged along the x, y, and z spatial axes. Laser beams are coherent, absolute agents that are used in this project to introduce gridding and dividing systems applied to realworld objects. 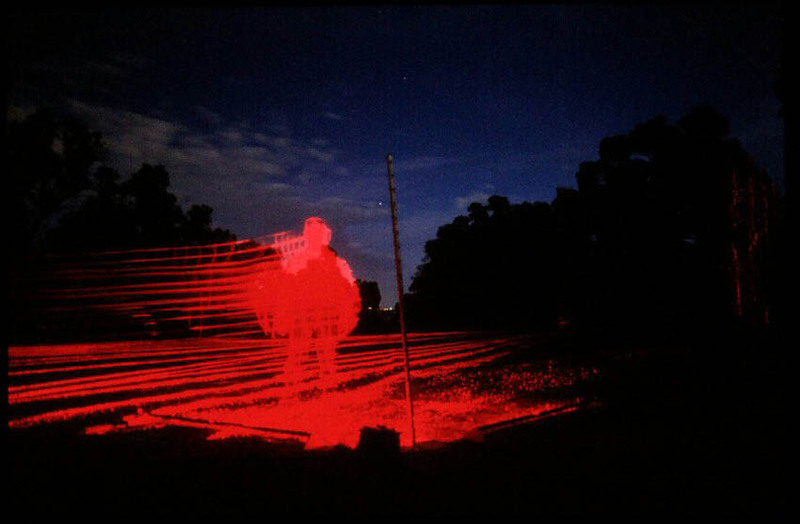 Lasercube is a collaborative project with Richie Kuhaupt. 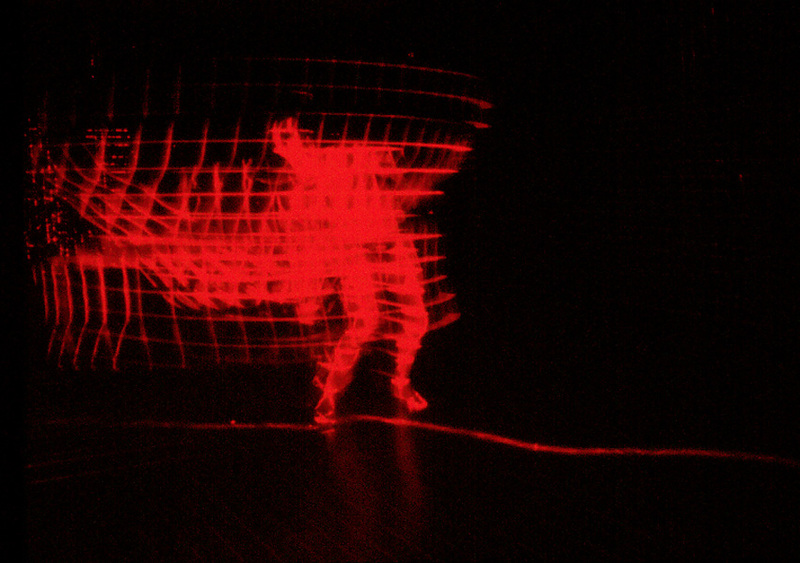 One image shown is of a performance piece (Lasercube II) developed in collaboration with Skadada, dancers; Jon Burtt and Lucy Taylor. 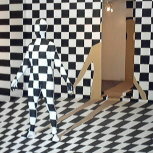 Chromeskin is the result of a three year collaborative project between Geoffrey Drake-Brockman and Richie Kuhaupt. 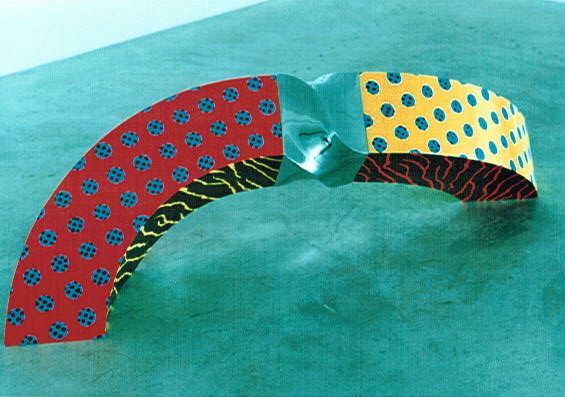 Chromeskin was a finalist in the 2001 inaugural National Sculpture Prize and Exhibition, and was on exhibition at the National Gallery of Australia in Canberra from November 30 2001 to March 10 2002. The work was awarded Highly Commended, by the National Sculpture Prize judges. 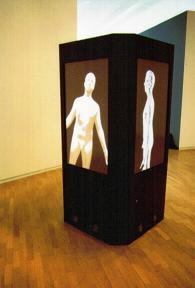 Quadrascope is an omidirectional interface device that displays a large-scale animated version of Chromeskin on each side of a large rectangular prism. The device displays images derived from the Chromeskin laserscan data, processed against the current visual field around it. 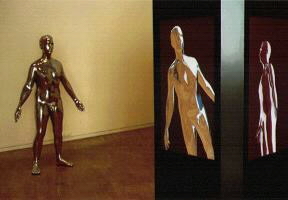 On each face a representation of mirror surfaced Chromeskin is displayed, with the figure reflecting and reacting to the movements of the viewer in realtime. Quadrascope is driven by synchronised 3-D rendering software written for the artists by headus (metamorphosis). Quadrascope forms part of the Chromeskin project created in collaboration with Richie Kuhaupt. 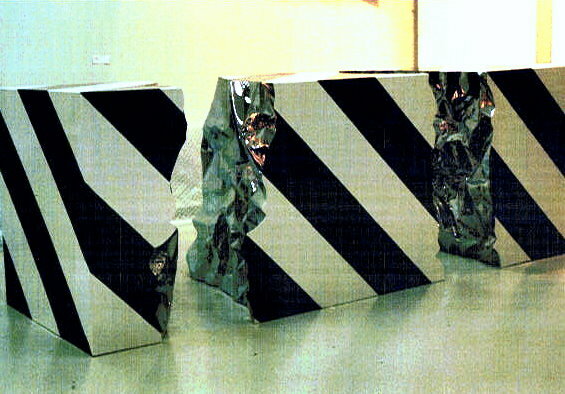 Highly Commended Award, National Sculpture Prize, National Gallery of Australia 2001. Emission is an exported cyberterritorian. Here crystallised is the cyborg intermarriage of amorphous, sticky, organic potentials, wetly embracing the rigour of regularly expressed delineated systems. Emission is a denizen of the digital realm that has been swept from its native virtual context into the world of mundane tangibility and deposited here on the shores of our reality. 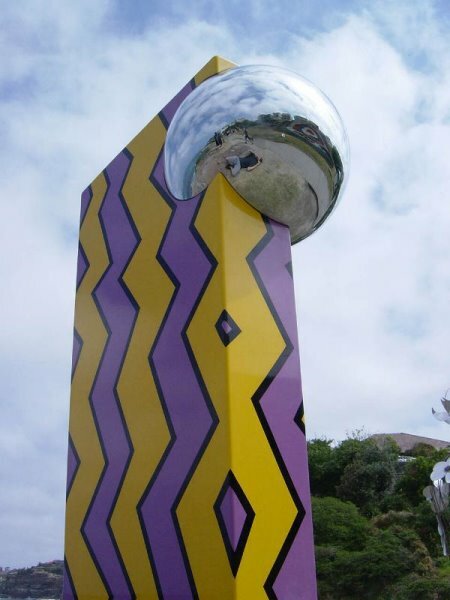 The key process of the Geoffrey artwork is a single-point ocular gridding of the installation space. An ideal perceptual chequerboard that is suggestive of networked and delineating technologies, as well as linear and ordered mental systems. In a sense, Geoffrey depicts a sensorium, an inner space or Cartesian theatre where mental processes are played out. In here, Geoffrey is both actor and audience, caught in the cycle of his own awareness. Geoffrey: information technologist, man-who-would-be-robot, logician. Under the perfect ordering principle Geoffrey is rendered monodimentional. Geoffrey was created in collaboration with Richie Kuhaupt. Maria was the robot/girl heroine of the 1910 Fritz Lang film masterpiece "Metropolis". Phasespace is a mathematical abstraction - an infinite-dimensional space in which each point fully specifies the total spacetime of an alternate universe. Phasespace encompasses all possible universes - by extrapolation, phasespace hints at the potential embryonic in 'cyberspace'.